My mom has a inspiration notebook, mostly for embroidery ideas. It’s where she write down quotes she wants to embroider and where she sketches out ideas sometimes. 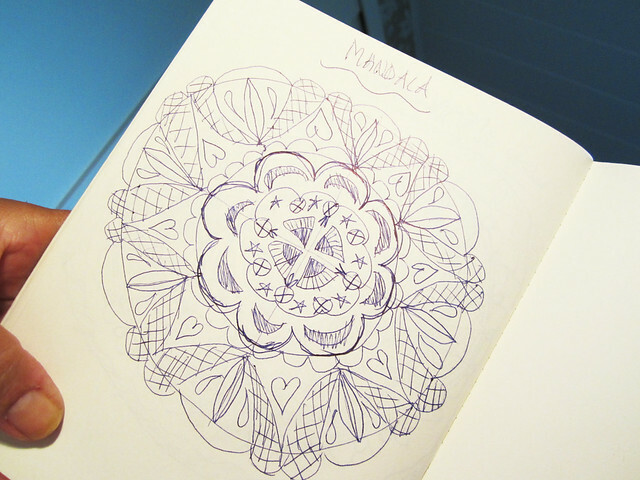 Recently she showed me these mandalas that she’d doodled and it made me all warm inside. Guess who, with all my talk, inspired her? To me it’s so great to come upon evidence that you have inspired someone else, especially mom, because she inspires me so very often. 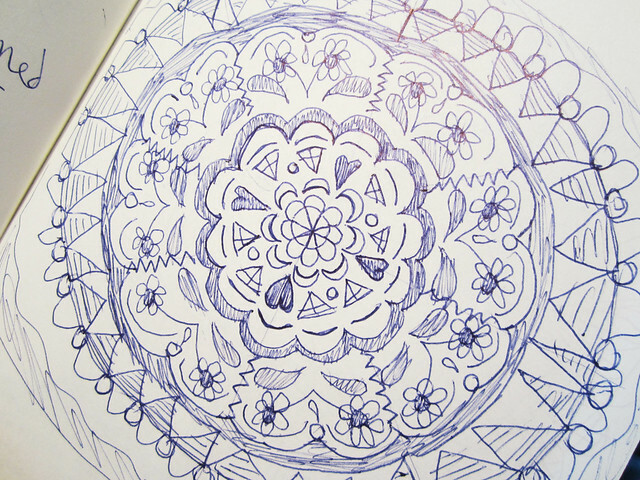 This entry was posted in Other's Creativity and tagged doodle, mandala, momcraft. Bookmark the permalink. Yummy!!! So happy, happy, happy! How great, but I’m sure you’re a great inspiration to alot more people than your mum. You’ve inspired me all the time, but I guess you knew that already. It’s nice to know though that one inspires other persons. We all could become better to tell one another I think. Thanks for beeing so inspirational! I love you, väldigt kul att läsa vad några slarviga skisser kan ställa till. Du är min ängel. This reminds me of Andrea Joseph’s ball point pen sketches. Just awesome! Mom has a great sense for pattern and flow. I like this a lot. This is truly an inspiring thing to see before my weekend away from the office! Please tell her thanks for me. Also, tell her I can’t read Swedish, so she can call me later and tell me what her comment says! oh, and I think you’re an angel, too!